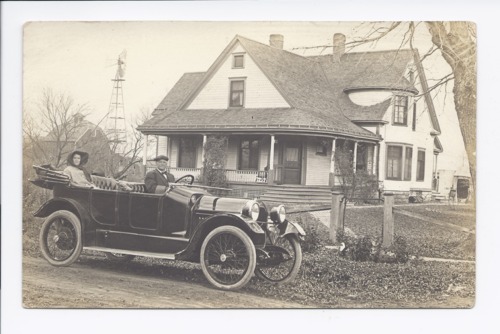 A photograph of Dr. Henry H. Miller and his wife Ella Wyatt Miller, in an automobile. This car was one of the first ones purchased in Rossville, Kansas. It was a 20 HP "Aurora" Runabout and was owned by the couple. The house in the picture no longer exists due to a fire in 1989. It was located at the present site of 304 Main Street. This photograph is provided through a pilot project to host unique cultural heritage materials from local libraries on Kansas Memory and was accomplished by mutual agreement between the Northeast Kansas Library System, the Rossville Community Library, and the Kansas Historical Society.